Hard Rain is a hybrid pachinko sim / tower defense / puzzle hybrid. 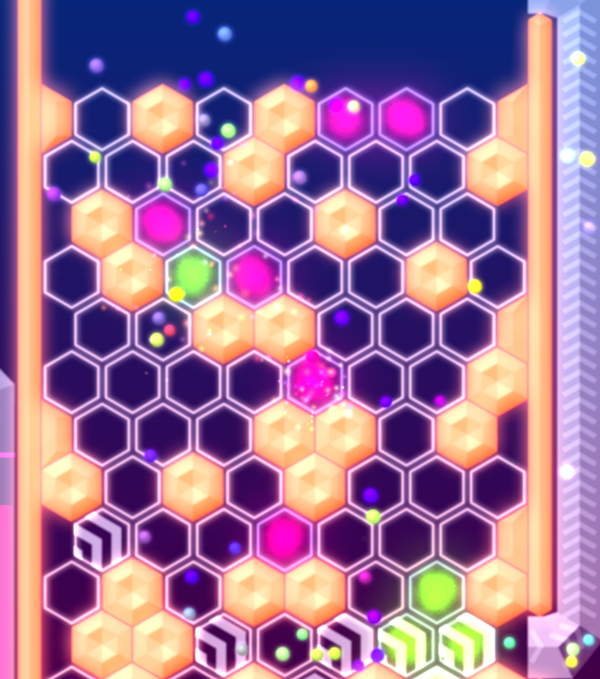 The basic idea is that drops fall from the sky through the level, which consists of spaces in a hex grid. In the style of a classic tower defense game, your objective is to last the length of the level without too many of the enemy (here the drops) getting all the way through the level. You build your defenses on the spaces in the grid. Each space can contain one of each of three types of defensive components - FIELD, SOLID, and FORCE. You can combine the various types of these components in strategic ways to control and destroy the drops. The graphics and effects look nice, can't say nothing more just from screenshots though. Working on a playable alpha and video... here's a quick gif showing a bit of the gameplay in the meantime. Played alpha a little, didn't really know what's the diffrence between field types so I just spammed some propellers and destroyers in gathering spots. It looks really good, and the sound balls make when popping is sooooo satysfying :D Game crashed every time I tried to replay level or when I chose that world/stage 0 in the menu, though you're probably aware of all that (windows 8 ). Still, good luck with that, it's really nice now and I will probably play it some more when I will got time. The idea for the name came from the balls or 'drops' falling from the sky, which reminded me of rain. Or really more like hail (hard rain). It's true though the name is mostly cuz I like the way it sounds. Thanks for the feedback. Glad you like the popping sounds - I spent a really long time tweaking them to get them like that so it's good to hear. Sorry about the crashes - I actually didn't know about them but I haven't tested enough on windows yet - I'm tracking them down and will have a new build up as soon as I can. Yeah the zone 0 is kind of a tutorial that introduces a lot of the things you can build so it's pretty important to have that working. So I've been MIA for a while but development is still progressing. Closing in on a second alpha release. A lot of what I've been working on is further revisions to the way the game is introduced to the player. Less of a strict tutorial and more of a gradual introduction of elements through gameplay. So I'd be curious to get some feedback on it once I get it posted. Added this music for the title / level select screen. Mostly what is new is the levels, which are shorter and more limited but also more varied in the beginning, introducing the concepts of the game one by one. Not sure how I feel about the drop shadow. Each color channel is on a scale of 0-255. So this means as the drop is damaged (hpPercent goes from 1 to 0) the red value increases from 90 to full and the blue channel drops to 90. The green channel is simply linked to the damage multiplier effect of the compromiser component. The values are tweaked a bit here, but the main difference is that the blue channel is also linked to the multiplier effect, so it decreases by just a bit ( /5) as the multiplier increases. This seems sort of trivial but it has a huge impact on the appearance of the game since all 3 channels never all have high values simultaneously, leading to washed out colors. Instead I'm getting a lot of of neon greens, yellows, and oranges that weren't there before. I am worried that this may be too visually "noisy." I'll check out the version you posted to double check but from a glance it is just messy. I think it improves the readability of the game state somewhat. But yeah if you have any feedback from trying it out let me know.